How can I run/stop/relaunch an application automatically, at boot/login/some other time? How do you make a script or app to run or stop running automatically when the system is booted, a user logs on, at a specific time, when a disk is attached, etc.? then you want to use the technical solution that is launchd. The easiest way to set up a launchd config file is to use a tool to help. At the time of writing the most popular method is Lingon (which has an older free version available from SourceForge), or the PList Website tool. The RunAtLoad option will launch the application the first time launchctl runs this. The KeepAlive option will re-launch the application if it crashes. Launchctl will run this after reboots. There are many additional options that can be found by experimenting with Lingon or by reading the man pages for launchctl, launchd.plist, plist, launchd.conf, etc. Lingon still works. I just used it last week to create a "scheduled task". After I downloaded it I had to use its auto-updater to get the latest version but it works fine. 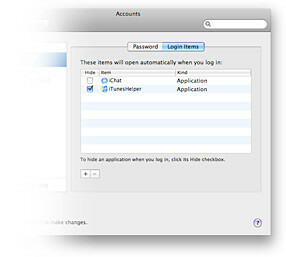 If it's only necessary to run when the system is booted, just use the Login Items tab of your Accounts preference pane in System preferences. do shell script "your script here"
logger -t $0 "executing .loginhook of user $user"
su - $user -c "$home/.loginhook"
Also, although 'launchd' is "the Mac way" crontab is still a perfectly viable option, and is much much easier to hand-edit than XML launchd files. Personally, I happily paid $5 for Lingon. Running an app at a specified time can be done easily in iCal, as I have just found out thanks to another forum! Make a new event in iCal for the time you want the app to open. At 'Alert' choose 'Open File' - so, you can set a file to open, which will obviously also open the default application for that file type. To just open an app, rather than a file, change the 'iCal' dropdown to 'Other...' and choose the app you want to run! Hide all other iCloud or shared calendars on the left hand bar by hovering over the calendar name and clicking the 'hide' button which will appear. Now right click (or Option click if you're a complete cretin and still haven't realised that you have more than one finger and can change your mouse preferences so that it is slightly more useful than its default 'cretinous brick for cretins' state) and choose 'New Calendar'. Because all shared calendars are hidden, this new calendar will be created as 'On My Mac' and will be local to this Mac. I've only just found this out myself, and was pleasantly suprised by both tips, so thought I'd share them here. Not the answer you're looking for? Browse other questions tagged macos boot startup login-items . How can I run a shell command at login time without showing a Dock entry? How do I run a cron job on a Mac? How to synchronize contents of two external drives? Is there a Mac equivalent for UDEV folder on linux? How can I stop OS X from automatically connecting to an NFS server on startup? How to make a script which runs on login? How do I stop OS X attempting to import photos on each boot? How do I stop folders automatically opening on my MacBook Pro 2014? How can I prevent macOS from restoring all applications after a hard reboot?